The world is in turmoil! THE SORCERER discovered a 21 turn spell that will destroy the world! YOU as a hero need to defeat the sorcerer! Good luck hero! This is a game for single player where you becomes the unfortunate hero that need to defeat the sorcerer that wants to destroy the world with his 21 turn spell! This entry was posted on Sunday, November 29th, 2009 at 2:07 pm	and is filed under Free RPGs. You can follow any responses to this entry through the RSS 2.0 feed. Both comments and pings are currently closed. Does “defeat the sorcerer” mean the sorcerer is in the cave at the upper-right of the board? You have to get there with 10 turns to spare in order to win? I was disappointed that forest/plains have exactly the same monsters. It seems like these should be different. Can I buy more than one sword/armour/boots? The character sheet suggests one each, so a maximum of 7 BP? Maybe the sheet should just say “Genji Sword” with a checkbox next to it, if you can only buy one. Yes the sorcerer is in the cave (upper-right of the board) he don’t move at all because he is preparing the 21 turns spell. And yes you need 10 more turns, which is obvious you need to gather equipment and power-up to fight him. and thank you again for playing! I really like it — I can imaging playing this during downtime at work. I like that you don’t need any dice, just a couple of coins and a pencil. And it’s so modifiable. 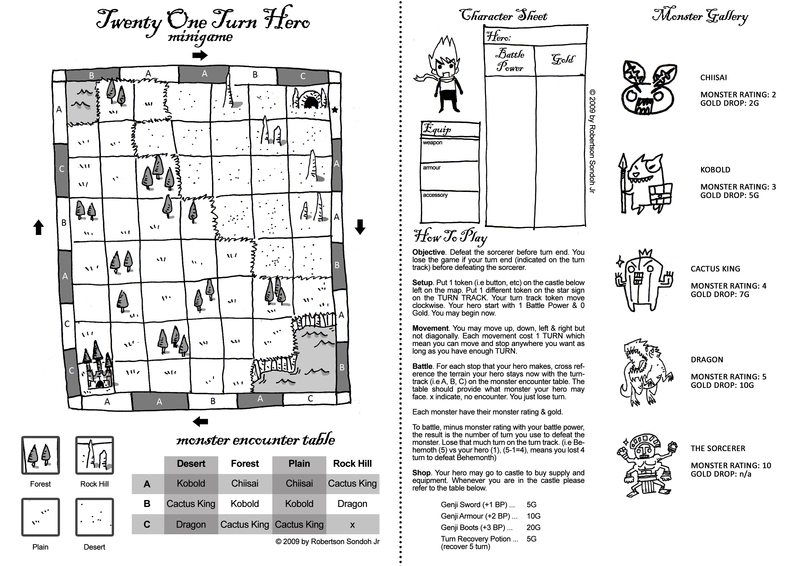 You could easily add more equipment, more monsters, new maps and still easily fit on one page. Great stuff. How is it licensed? Some form of Creative Commons (I hope?) I’d love to make some mods. p/s: i would like to play your version! yay! I am in AWE. Wow. Deceptively simple, delightfully playable. Seeing this game is essentially a resource management exercise, I immediately set about to break it. ^__^’ But it turned out to be not so simple, thanks to the ingenious interactions of the Turn track and terrain placement. Is there a minimum Turn requirement for combat? Ie, if I have all items (BP 7) and attack a Chiisai, do I lose one or no Turns, or do I actually gain five back (2-7=-5)? My solution: have the Potion have a variable effect based on the letter on the Turn track when the player enters the castle (eg. A: -4 Turns, B: -5, C: -6), and/or have the castle store only carry ten (for example – I haven’t done the math). If you put in the checkboxes, there could easily be a row of them for the potions. That said, a marvellous effort! Keep up the good work! In the game, player cannot hoard the potion (maybe i should change that to something else), you can only drink that potion in the castle and it takes effect immediately. Also, when doing battle, you don’t gain turn, and you don’t lose turn when fighting some lower rated monster. I don’t know why I didn’t notice this game before. It is pretty clever, all in all. Reminds me a lot of the mini-games you could get in the RPG annuals in Japan. I would like to see at some point a more elaborate version of this (but then, I always like to see things pushed to their limits…), that maybe could involve group play as a board game. I would definitely like to see the mini-game from RPG annuals in Japan you mentioned. I did actually try to elaborate this game, but seem doesn’t have time to do so. If you manage to do one, please post it here, I would like to play it. Thanks again for playing my game.